The Chevy Spark was the only minicar to earn a top safety pick award in small overlap front crash testing conducted by the IIHS. DETROIT (Reuters) -- Minicars such as the Fiat 500 and Honda Fit performed worse than any other vehicle segment in a U.S. frontal crash test that mimics what happens when a car hits another vehicle, utility pole or tree. 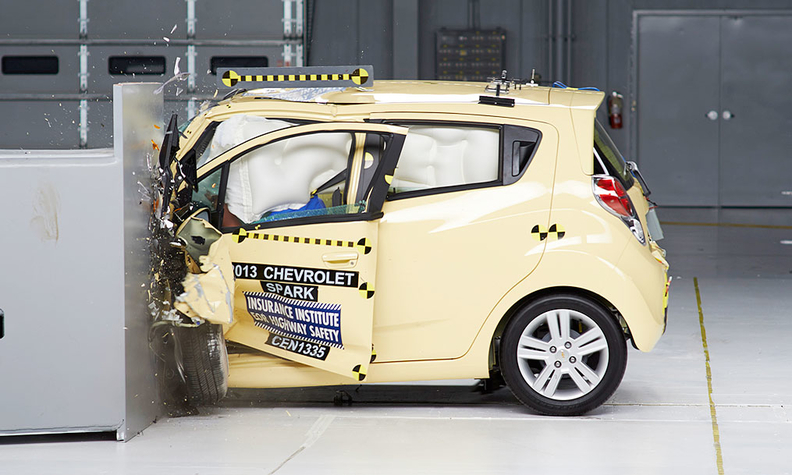 Of the 11 minicars tested by IIHS, only one won an overall "acceptable" rating in the so-called small overlap front crash test: the Chevrolet Spark made by General Motors Co., the Insurance Institute for Highway Safety said today. But the Spark does not protect occupants as well as larger, heavier vehicles with the same rating, IIHS said. Minicars can weigh more than 680kg (1,500 pounds) less than the average model made for the 2013 model year, preliminary U.S. data show. "Small, lightweight vehicles have an inherent safety disadvantage," Joe Nolan, IIHS senior vice president for vehicle research, said in a statement. "Unfortunately, as a group, minicars aren't performing as well as other vehicle categories in the small overlap crash." In the test, part of the car's front end hit a 5-foot rigid barrier at 64kph (40 miles per hour). The vehicles were rated in three areas: structural integrity, the effectiveness of the restraints and potential injuries. Every minicar, including the Spark, got a "poor" or "marginal" rating for structural integrity, which IIHS called "the most fundamental element of occupant protection." These are the two worst ratings possible in this test. Four minicar models were rated "marginal," including the 2014 Ford Fiesta. Six were rated "poor," including the Toyota Prius c. None of the models received the best possible rating of "good." The Honda Fit, sold in Europe as the Jazz, and Fiat 500 were the worst performers. By comparison, the Fiat 500 scored a maximum five stars when tested by European safety agency EuroNCAP in 2007 and the Honda Jazz earned a five-star rating in 2009. Since 2012, the organization has adopted even stricter testing in relation to adult occupant, child occupant and pedestrian protection.